Large open 3 storey home with wonderful views of Terrigal and the beach! Pacific views Beach House is a original style beach house cottage, with modern furnishings spread out over 3 levels with 5 bedrooms. WE LOVE HAVING FAMILIES AND FRIENDS ENJOY OUR HOLIDAY HOMES BUT PLEASE NO PARTIES OR LOUD NOISE AFTER 10PM IF YOU ARE COMING TO TERRIGAL TO PARTY PLEASE LOOK ELSEWHERE*******. You can Now like our fan page on facebook to receive updates and red-hot specials on upcoming dates click LIKE " YOUR HOLIDAY HOMES "
For the early riser enjoy watching the sun come up over the pacific ocean and you enjoy a relaxing breakfast on 1 of the 3 large decks. Take a stroll town to terrigal town center where you can enjoy its many cafes and restaurants then take a swim at beautiful terrigal beach. The house enjoys magnificent views from the upper deck. And filtered views from the other 2 decks due to the abundance of native trees. These provide welcomed shade in summer and also make it great for feeding the many local birds morning or afternoon from the decks. All 3 levels have the own new decks as well as rooms and bathroom or toilet facilities. 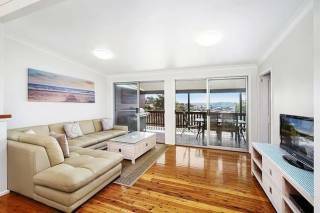 Terrigal beach is just a short walk away. 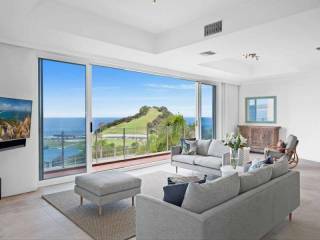 The top storey has 2 large queen bedrooms, a bathroom and spectacular views of Terrigal beach its shops and the crowne plaza. With 1 queen and 1 sofa bed in the larger room and one queen and 1 single in the other room. both good sized rooms. The middle floor features open plan kitchen,dining room and lounge a large beedroom with queen bed . the lounge leads out to the middle deck where you can enjoy the ocean breeze and BBQ facilities as well as relax on the outdoor chairs or enjoy dinner "al fresco"
There is undercovered parking for at least 2 cars, more for smaller cars as well as extra parking in the driveway. Please note these are the starting price. Most weekdays are from $300.00 and a minimum night stay applies. Eg 1 night $500 2 night $400 per night and 3 night s usually $1000. 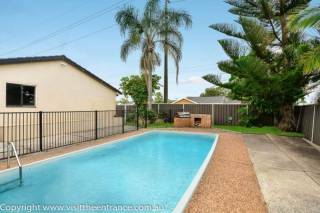 4 and 5 night bookings are from $300 per night. Most weekends are $1300.00-$1600.00 and are minimum 2 night stays 1 night stays on weekends are available but are charged charged at a premium due to cleaning and setup costs. Our specials discount rates only apply to weekends usually.